My name is Lisa and I am a 32 year old runner from Springfield, Ohio. I have been active most of my life playing soccer until I was 19 then I switched over to running. I ran my first half marathon in May 2010 and ran my first full marathon in October 2010. I am now hooked on running and plan to do more 5Ks, half marathons and full marathons. In August 2009, when I was 25 years old, I was diagnosed with Multiple Sclerosis. MS can be a disabling disease and some days are rough but I am trying to not let that stop me from running my next marathon. I graduated from Springfield North in 2002 and Wittenberg University in 2006 with my BA in Mathematics. 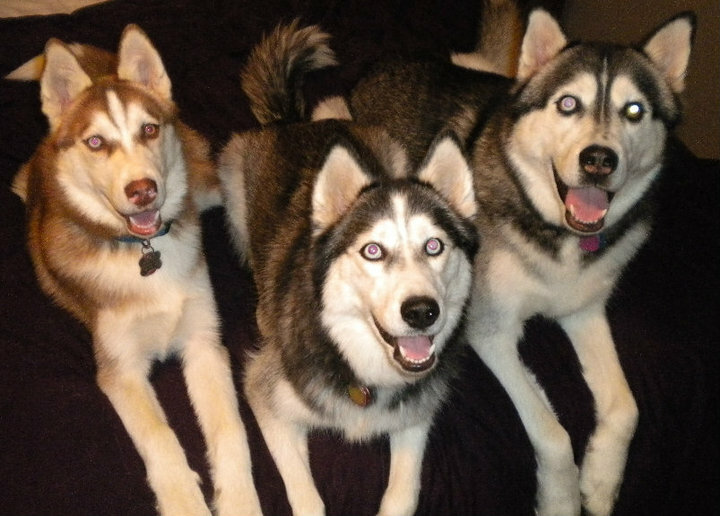 I currently live in Columbus, Ohio with my boyfriend, Tom, and three Siberian Huskies: Chico, Zoe and Phoenix. In 1987 I was diagnosed with MS and in 2008 I ran my first half marathon (ran my 7th half last month). While I am not a star I believe running is one of the best things that ever happened to me and my MS (I am 47)! I am inspired by you and encourage you to listen to your body. Keep running and be strong. I am much older than you – 40! I was diagnosed with MS six years ago, while pregnant with my second son. I have just recently began running, completing a C25K program. I have ran in two 5K’s recently and am scheduled to run one later this month and a 10K in March. I have yet to “find my stride” and am not a fast runner. Do you have any suggestions? My knees hurt like crazy, but I refuse to give it up! If you are having a lot of knee pain that might be why you are having issues finding your stride! My stride looks and feels bad when I am in an sort of leg pain. I would suggest taking a closer look at your shoes. A lot of minor injuries can be caused by not having the right type of shoes for the distances you are running or for how your feet hit the ground. Most running stores (not sporting goods stores, true running stores) actually have trained their empolyees to watch you run and narrow down the type of shoe you should be using so they should be able to stear you in the right direction. My second suggestion would be to cross train. Maybe just bike for even one day a week. It keeps you moving and should get some muscles you don’t use very much or at all while you run moving to try to help balance everything out. Hope that helps some! If not you may want to consult your doctor. That’s great! Sounds like you have a lot of experience with dealing with typical running issues and MS issues. I have also noticed how much stretching more in the evenings or when I am just watching a movie has helped me as well. I have also considered looking into the deep tissue massages too. Thank you for all the info! I am 40 years old, I was diagnosed M.S 8 years ago. I used to tun 10 kms. races but that is over for me, waht is more, now it’s extremely difficult to run even 2-3 Kms. Nevertheless I continue fihting and trying to run more every training day though it is dissapointing to check that my left leg seems not to want run with me, but I continue and will continue fighting, perhaps the war is lost but I have battles to win. If you want I’d like to continue writing in this web, perhaps it will give me strenght and support to keep on figting. Been Dx’d since I was 20 years old, will be 41 next month (yikes). I gave up running soon after my diagnoses because it was just too stressful on my system and I ended up hospitalized 3-4 times a year because, well, I was just out of control and didn’t take care of myself properly. Finally after 20 years I’m back on trac ( guess I’m a slow learner, haha). Been running again regularly since august. Love it!! Ran my first 5k on Thanksgiving- The east side turkey trot- and just ran a 4.5 mile race last week at Levis commons. I think I’ll be keeping it up and it’s great to know that we “disabled” girls can still kick some booty! Keep up the good work and so will I.
I enjoyed reading your post. I’m a 30 yr old (well, my birthday is Friday) male and I was diagnosed with MS almost 4 years ago. I didn’t have any major problems until Oct/ Nov last year where I couldn’t walk. Now, I can. (Thank God) I made a promise to myself that I will run again. Well, thank you for your inspiring post. I’m on facebook. Take care and thanks, again! Hi, I’m a 46 year old runner in England, RRMS, just signed up for my first marathon in April 2013 (did a half in September). I find MS gives me a lot of focus – seize the day, and all that. Thanks for the blog. hi Lisa – I’m Leah…I’m 36 and currently showing signs of demylation as per my neurologist. I am in the testing stages to determine if I have MS and as you may know the process is long and frustrating. I feel like I’m in limbo… In the meantime, I took up running (about a year ago) and aiming at short runs at the moment – 5K’s – and have my first race in August which I’m excited about. Running for me, feels like trying to take control of my body when it wants and feels like it’s doing the opposite. Finding your blog is incredibly inspiring. Thank you! I am so happy I found your blog. I am a runner too, 29 years old, and recently diagnosed. I have 5 half marathons scheduled this season but I am having some issues during training. I have no one to talk to about my issues… that is, no one that has been there. I look forward to getting to know you through your blog posts. Never give up! Hello. I am new to your page and recently diagnosed with MS. I use to be an avid runner up until 2 years ago when I got sick and they couldn’t figure it out until this past march when I got optic neuritis. I wasn’t to start running again but am having a rough time between the pain, weight gain etc. your help with this is greatly appreciated. My rail is ssteingruber@hotmail.com. It’s always great to hear from a new MS Runner. Welcome to the group! Hi; I was diagnosed with MS in 2005 after my 7th child wasborn.I have always been a very active person, having 8 children and active jobs.After diagnosis i decided to take up running, i was 44 and I have completed several 10ks 2 half marathons in good times plus parkruns. I also got my first running trophy for 10k race in which i was firstin my age group.How things have changed in2 years.Spasticity in my left leg has worsened, i have tried 2 lots of drugs, none touching me, so have decided to plod on , however The symptoms are relapse remit.All I can say to all you people who have this horrible illness just keep positive like me and keep runnimg.I am now 52 and still mot ready to give in. Way to go! Keep it up! Hello Lisa. I am glad I found you. I was diagnosed recently in the same age as you. I am not runner at all, however, I dream to be healthy and to be physically strong. Thanks for sharing your story with us. You’re cool. Thanks for following and the comment! I was diagnosed a little over 4 years ago on my 22nd birthday. I started running about a year after that in some attempt to reclaim control over my own body. I ran my first half back in March and have my next in November. Thank you for sharing your story! Welcome to the club! Awesome job! Keep it up! Follow MS Runner on Twitter!! !